One thing I love about the Pennsylvania Renaissance Faire is all the beautiful artisan products. Jewelry, glass, blacksmithing, woodwork, they are all at the Ren Faire, but I discovered one place that made me excited. My friend Joan and I had been at the Faire no less than ten minutes when I saw it: a line of hanks of yarn drying on a line. Being that I’m a yarn addict and am attracted to bright colors, I had to go take a closer look. What I discovered was KareDan Farming Initiative, a farm where Renaissance farming techniques are practiced. They are located in Baltimore, MD, and have a stand at the PA Ren Faire. 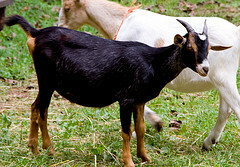 They have everything from their own honey from their own apiary to soap from the milk of their goats. Still, my main focus was the yarn. 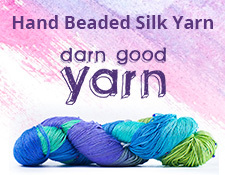 Their yarn is beautiful. It is handspun and hand painted, and was sheared from their own animals. There are blends ranging from alpaca to wool. 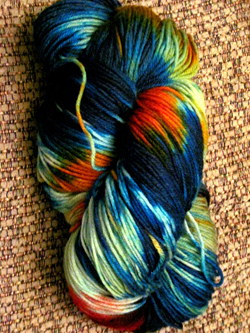 The hank that my hand went for was a bright blue and orange one of superwash wool sock yarn. (I know, more sock yarn!) It came home with me. Oh, spinners, they sell roving from their animals, too. Danielle of KareDan gave a quick demonstration of how to shear a sheep using her Shetland sheep, Badger. Now, Badger’s fleece was too short to be shorn, but she put him through the motions. I also spent time skirting the fleece previously shorn from Badger, and spent time speaking with Karen of KareDan about their farm and crafting. I also learned what lanolin is and that is why sheep shearers have soft hands. I also loved seeing part of the process that shows me how yarn is made. If you are going to the PA Renaissance Faire, please visit their stand. Other demonstrations are given by Karen and Danielle, too. There is a lovely herb garden in the back and they have a petting zoo. I plan on going back towards the end of the season sporting a pair of socks knit from that hank. In the meantime, I encourage you to take a look at their web site, Facebook, and Etsy site. These two women are using their animals to the fullest and are preserving Renaissance farming heritage. I highly recommend checking them out.